June 11th, 2008 @ 3:19 PM All Politics is Local,Crime & Punishment,Downtown,The District,WTF?! Since I work on our website and just don’t generate much paper waste, I made mental note of what common items in my cube would go into which containers (soda cans mostly, like any self-respecting geek), assumed that the promised at-desk recycling boxes would once again not make it to me, and didn’t think about it again. “Um, empty, mostly…” I pulled my trash can out, displaying the two items inside: a used sub shop napkin and a square of paper. “What’s THAT?” she said, indicating the non-napkin item. “Oh, it’s a page from this calendar here,” I indicated my Page-A-Day calendar. Coated paper, questionably recyclable. “Okay, great.” She walked away. And then I noticed the email she had sent shortly before- a DC Recycling Inspector was going to be visiting our building the next day and would be issuing fines for any violations. But that’s how it came to pass that this very morning, before the arrival of the inspector, the Senior Director of my division came around to each individual member of our department, and delivered a perfunctory speech about how our organization takes recycling very seriously both for environmental and fine-avoidance reasons, and that complying with company procedures is the responsibility of every employee. I’m so delighted that commitment to efficient stewardship of our resources extends to how DC businesses must spend the time of their well-compensated executives. If you were wondering, we passed our recycling inspection perfectly. 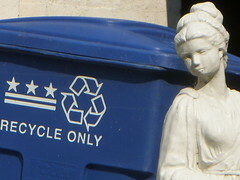 In fact, only one tenant in th building was fined for recycling violations- an office of the DC Government. Yikes, I moved out of DC just in time. There are DC employees who dive into public trash cans on our hot sidewalks looking for envelopes addressed to nearby businesses that are sneaking paper into public facilities. These folks deserve medals. When I supervised a business facility in DC I, um, refused to pay our commercial hauler extra for a separate aluminum can container and service. As you can imagine, the 26 developers working in our center generated an awful lot of empty cola cans. I established an arrangement with the nice old guy who wheels a Safeway cart around Capitol Hill pulling cans out of sidewalk trash repositories. He took our cans for free. I heartily recommend this. Keep your business in the ‘hood.